Enjoy a salty treat at the ARG Facebook Page. il take your apple pie and raise you barbe q with dorn on the cob straight from the cow and the stalk and the cow ps the cow is now mad at me. this comment was a mess all around barbe q from the cow and corn on the cob ok did i do a good job explaining this? I love anything potato. Bring it on! We have a poutine food truck in town and I’ve yet to track it down. SOOOOOOON. I visited Canada once and on a whim tried poutine at a restaurant. I’m addicted. It won’t be long before I’m a poutine kingpin, smuggling product out of Canada and into the United States, riding the gravy train until I die in a hail of bullets when law enforcement catches me. add sausage for the perfect heart stopper! Everything is centered on Quebec City, the center of Canada, nay the universe. And taste, hearing, and touch? .. and irony. Only natural fibers here. Sling some over here ARG, I’m hungry! I once had a conversation with a Canadian about poutine. I’m an Irish guy and it means something very different to me, so the conversation was odd for a while until we figured out they were two different things. Man, I wish I could find poutine in the UK, I really wanna try this stuff! Just get some good chips, good gravy and nice fresh squeaky cheese curds. Yum. almost any chip shop, ask for cheesy gravy chip. Can I get two to go? Looks great for dinner or is it ok for breakfast too? The Canadian answer: It’s good for breakfast, lunch, dinner, on the go, in the car, Eat it on your first-second-third-every date, eat it to celebrate, eat it to comfort, eat it at your wedding, eat it at your friends wedding, eat it at a funeral, eat it at a baby shower, eat it like it’s your last meal, eat it like it’s the only meal, eat it in prison, eat it at the bank, eat it under your flag, eat it on the can…. of poutine that is… eat it eat it eat it anywhere and any time you want! By the way, this is the first comment I’ve ever left in your comic, and I’d like to say I love it. Hey Xavier… which country? We will send the National Poutine Millita to your country with a bag of curds on the double! And you better do it quick! At first i read “turd”. And i laughed. Next thing I know is that my I felt eyes widen and an uncontrol, maniacal smile form across my face, streching to the point of where my headset moved to accomodate it. I tried poutine. I’m not a big fan of brown gravy so it didn’t do anything for me. I prefer chili and cheese on my fries. The beauty of poutine. Base poutine is brown gravy… but you can add… pretty well anything to it… Like Chilly! Glad you caught on.. Oh and, sorry for deceiving you eh? I tried to eat poutine when I traveled to Ontario. Not the same as what we’ve got in Québec. Also, the streamlined poutines in the fast food chains (McDo and the like, excepting Ashton) is in this category. Also, in French, Russia’s [u]dictator[/u] president’s name is written “Poutine”. Yeah, we laugh everytimes, whatever he does. 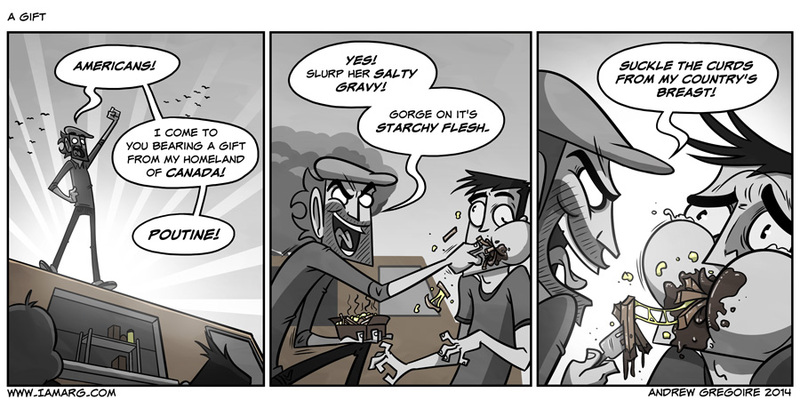 heh, i come from a land where poutine is known merely as cheesy gravy chips. also has curry and chicken versions. poutine, from canada with love. Where I’m from we eat poutine for breakfast and sing folks song about poutine (check out my link). Poutine was invented here in Victoriaville. And guess what, it’s not pronounced poo teen but putsin. Hey send some my way, I am from Canada but i can still get some free poutine right? Poutine is like my favorite meal when we start a night of pen-and-paper role-playing game, you just feel so good eating it, letting the grease coat your throat for the passage of those salty cheese curds and tender French fries. BTW, I don’t know what Stefenheif has against Ontarian poutine but I’m pretty sure they have the right ingredients handy. Also, you can’t only judge the meal from it’s city (I’ve been pretty disappointed by the poutines from Drummondville, and it’s one of the 2(3) cities claiming to be it’s birthplace. Awesome, you beat me to that comment. Great minds man! The only gift we need about canada is beibarf staying where he belongs. I would love poutine, except the cheese curds. Have mercy on my soul for my heinous crime of disregard to grammar.